The painting was in a beauty salon where I have a hair cut in my town every month. At the moment I saw the painting, I immediately fell in love with it. 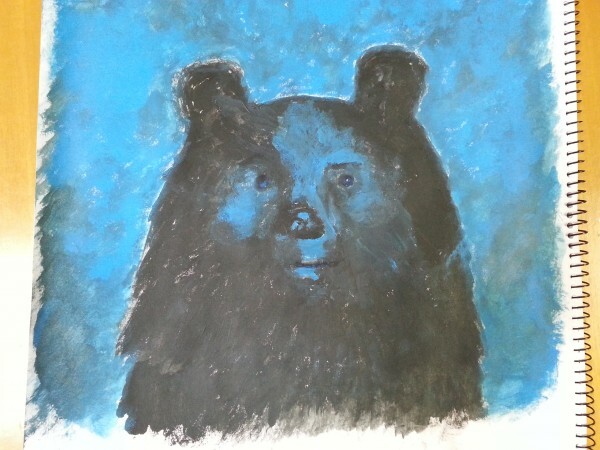 The painting was the face of a bear in blue. The color was dark and cool but the bear’s face was gentle. The contrast attracted me. He answered one of his customers who lives near the salon. I wondered if the person could teach me painting. One day, the picture was gone, because it was sold. I felt very sad. Then, I decided to meet the painter. We met at a Starbucks, the only one in our town. It was the first time I met her so I was quite excited. She was a nice person, exactly like I imagined. I knew that that blue bear picture was painted with acrylic. We talked a lot. Fortunately, she said that she can teach me painting, though she has never taught anyone. I’m going to learn painting. I should have taken a picture of that blue bear picture before it was gone. Wait, I could be painting a blue bear picture by myself with her help. *The painter who teach me is nanaki jun.